Today we have more Road to Cheltenham thoughts from Mark Foley. 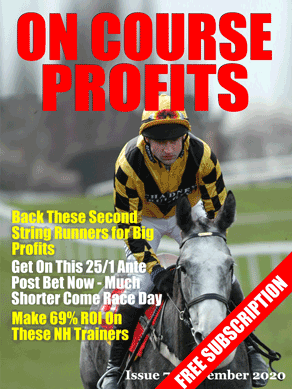 Sprinter Sacre is a silly price for the Queen Mother but this has created a decent EW market. Last year's winner Finian's Rainbow looks too big at 10/1. He proved his undoubted class by following up his success here last year with a comprehensive win in the Melling. The failure for the only run this season can be attributed to the heavy ground, which he appeared to hate and ground permitting will reappear on Saturday at Ascot. I've already covered the age aspect in the Champion hurdle, but it is not so prevalent in the shorter chases. Whereas 8 and 9 yo runners have struggled in the Champion Hurdle in recent years the last three renewals of the Queen mother have been won by a 9yo and you have to go all the way back to 2005 and the great Moscow Flyer to find a winner aged older than 9yo. Since the Moscow Flyers win 16 runners aged 10 or older have taken part in the race and as all 16 were beaten it would appear than runners older than 9 struggle, but that's not necessarily true as just under half of them actually made the frame. When you consider that half of the 16 older runners were no hopers who went off at 33/1 or bigger and that all but 2 of the 8 runners who went off at 20/1 or shorter actually made the frame, then it paints a completely different picture. All but 2 of those older 8 runners were 10 yos and all but one of them made the frame. Finian’s Rainbow is a 10 yo and what’s more he is a very lightly raced 10yo. All 5 of the 10yo horses that made the frame in the Queen Mother were lightly race and had less than 25 career runs to their name. Finian’s Rainbow raced in only one PTP and never raced under rules until he was a 6yo, in total he has had 16 career races, which is incredibly few for a 10yo Chaser. He has won 10 of his 15 races under rules and won 3 of his 5 races in Grade 1’s and was runner up in the other two races in the highest grade, as a lightly raced horse he has tended to go under the public radar, but make no mistake we are talking about a very classy chaser. Flemenstar has all but been ruled out and Simonsig may not run in this race. Sprinter Sacre has been hugely impressive so far, but he has never met horses as classy as Sizing Europe or Finian’s Rainbow, who are both rated in the 170’s and has only ever run against two runners rated higher than 160 and that was on Soft and Heavy ground. This will be a different proposition and run at a faster pace than anything he has encountered before. Although Sprinter Sacre may officially be the highest rated horse in training, which goes someway to explaining his ridiculously short price, bear in mind that only one of the past 5 renewals of the Queen mother have been won by a horse that was from the top two of the official ratings. Finian’s rainbow looks like a solid EW bet to me if Nicky Henderson can get him to the Festival in peak condition.